We first saw HP’s new EliteBook design when the 8460p and 8560p notebooks (p for performance) were displayed earlier this year, and now the Workstation edition of the notebooks has been officially announced by HP. According to a press release, the EliteBook Workstation notebooks are coming soon and should be available in 3 different flavors; the 8760w, the 8560w, and the 8460w. First up on the list of new notebooks is the EilteBook 8760w that comes with a 17.3” display. The more powerful notebook of the trio can be outfitted with numerous processors ranging from a dual-core 2.5 GHz Core i5-2520M processor to a quad-core 2.5 GHz Core i7- 2920XM option. The laptop will also come with a choice of either an AMD FirePro M5950 or several NVIDIA Quadro professional GPU options (up to an NVIDIA Quadro 5010M). Furthermore, the notebook should be customizable with up to 32GB of DDR3 RAM and up to 3 storage drives via a RAID 5 configuration. The second laptop announced by HP, the EliteBook 8560w will also come with Core i5 and i7 options but is limited to a Core i7-2820QM processor as its highest option. The 15.6” laptop will feature either an AMD FirePro M5950, an NVIDIA Quadro 1000M or an NVIDIA Quadro 2000M professional GPU. Otherwise the 8560w can be outfitted with the same 32GB of RAM as its elder sibling, SSD and HDD options and an optional Full HD 1920x1080 pixel resolution. Finally, the smallest of the bunch is the 8460w that comes in at exactly 14 inches. There is no word on any Full HD display, but the notebook will have the same Core i5/i7 options as the 8560w but only offers the option of an AMD FirePro M3900 graphics card. It does however come with up to 16GB of RAM and weighs 2.22KG (4.9lb). As we previously mentioned, the laptops have all been outfitted with HP’s new EliteBook design and will feature a military standard magnesium lid along with a glass touchpad with dedicated right and left buttons. Both the 8760w and 8560w are equipped with an 8 cell battery, while the 8460w comes with a 6 cell battery and an optional 9 cell upgrade. The notebooks will start at $1,899, $1,349 and $1,299 for the 8760w, 8560w and 8460w respectively, and should begin shipping this May. HP today announced a new lineup of powerful mobile workstations, ideal for engineering, power-computing and content-creation customers who need the performance of a workstation with the portability and convenience of a notebook. Building on HP's "FORGE"#8221; design framework, the HP EliteBook w-series embodies a timeless construction, with precision-engineered durability features that are designed for maximum reliability and with the environment in mind. The new products showcase HP's first-ever industrial design specific to mobile workstations, with distinctive features including a radial-brushed gunmetal finish, backlit jewel logo and orange-colored accents. The mobile workstations also are certified by independent software vendors to run the most demanding professional applications, helping ensure reliable performance for mobile power users. * HP's most powerful mobile workstation, the HP EliteBook 8760w offers a 17.3-inch diagonal, high-definition (HD) screen,(2) a choice of high-performing AMD FirePro(3) or NVIDIA Quadro professional graphics and up to 4 gigabytes (GB) of video memory. (4) The EliteBook 8760w also can be configured with three hard drives and RAID 5 support – a first for HP mobile workstations. * The HP EliteBook 8560w features a15.6-inch diagonal HD display and supports AMD FirePro graphics for 1 GB of video memory or NVIDIA Quadro graphics for 2 GB of video memory. The optional HP DreamColor display on the EliteBook 8560w and 8760w(5) also allows for more than 1 billion active color possibilities. * HP's smallest and lightest mobile workstation, the HP EliteBook 8460w, starts at only 4.9 pounds and includes a 14.0-inch diagonal HD panel, in addition to an AMD FirePro 1 GB video memory professional graphics card for true on-the-road video performance. "As the fastest growing segment of the workstation market, mobile workstations continue to provide value to our most demanding design, animation and engineering customers," said Efrain Rovira, director, Mobile Workstations, Notebook Business Unit, HP. "The new EliteBook mobile workstations announced today combine innovative design with trusted, workstation-class technology to fuel creativity." The HP EliteBook 8760w, 8560w and 8460w include precision aluminum-alloy hinges and cast titanium-alloy display latches for enhanced durability. Sporting a radial-brushed display cover in a new gunmetal color, the portfolio boasts an aerospace design inspired HP DuraCase and is MIL STD 810G tested for drop, vibration, dust and altitude that might arise during on-the-go computing. (6) The HP EliteBook 8760w and 8560w also feature a backlit keyboard for workstation-caliber productivity, day or night. Additionally, the HP DreamColor display option on the HP EliteBook 8760w and 8560w(5) allows for more than 1 billion active color combinations – 64 times the capabilities of a traditional display – and uses a 30-bit notebook LCD panel to provide a level of color control exclusive to the EliteBook w-series for consistent color appearance from concept, to design, to production. The HP Mobile Display Assistant and optional HP Advanced Profiling Solution enable more precise control, adjustment and alignment of the DreamColor notebook display to ensure predictable color. 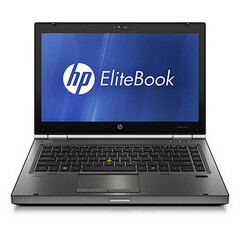 Built to deliver optimized workstation-class processing and support migration to 3-D professional applications, the HP EliteBook 8760w, 8560w and 8460w feature second-generation Intel® Core™ i7 and i5 dual- and quad-core processors,(7) offer premium performance and responsiveness with vPro compatibility,(8) and support up to 32 GB of RAM. HP EliteBook mobile workstations also offer a variety of storage capacity options, including SMART SATA, Self Encrypting or Solid State Drives, with up to RAID 5 capability. The mobile workstations are also equipped with a variety of ports, including USB 3.0, eSATA and USB 2.0 charging ports. Now available on HP mobile workstations, HP Performance Advisor, an intuitive user interface, helps keep applications running smoothly, while optimizing configuration and graphics performance. The HP EliteBook 8760w and 8560w offer an 8-cell primary battery, while the HP EliteBook 8460w offers 6- and 9-cell options for extended battery run time. All models include an HP Long Life Battery option. The mobile workstations also are compatible with the new HP Extended Life Notebook Battery and HP Ultra-Capacity Notebook Battery, which offer external battery supplies for additional run time. The new mobile workstations offer HP Professional Innovations, including HP QuickWeb 3,(10) HP Power Assistant,(11) HP Connection Manager and HP ProtectTools,(12) which includes standard drive encryption for data protection. SRS Premium Sound also provides optimized audio settings for voice and multimedia applications and delivers an audio experience for digital content creators or users listening to media-rich content and presenting multimedia-heavy presentations. The HP EliteBook 8760w, 8560w and 8460w start at $1,899, $1,349 and $1,299 respectively, and are expected to be available in the United States in May. More information about the products, including product specifications and images, is available at www.hp.com/personal. HP creates new possibilities for technology to have a meaningful impact on people, businesses, governments and society. The world's largest technology company, HP brings together a portfolio that spans printing, personal computing, software, services and IT infrastructure at the convergence of the cloud and connectivity, creating seamless, secure, context-aware experiences for a connected world. More information about HP (NYSE: HPQ) is available at www.hp.com.